High species diversity within a geographic area may be attributed to either recent rapid speciation in a ‘cradle’ or the gradual accumulation and preservation of species over time in a ‘museum’. China, home to nearly 10% of angiosperm species worldwide, is ideal for investigating patterns of plant diversity. Whether areas within China serve as cradles or museums remains unclear, as floristic components of putative ancient origin and recent diversification have both been discovered. 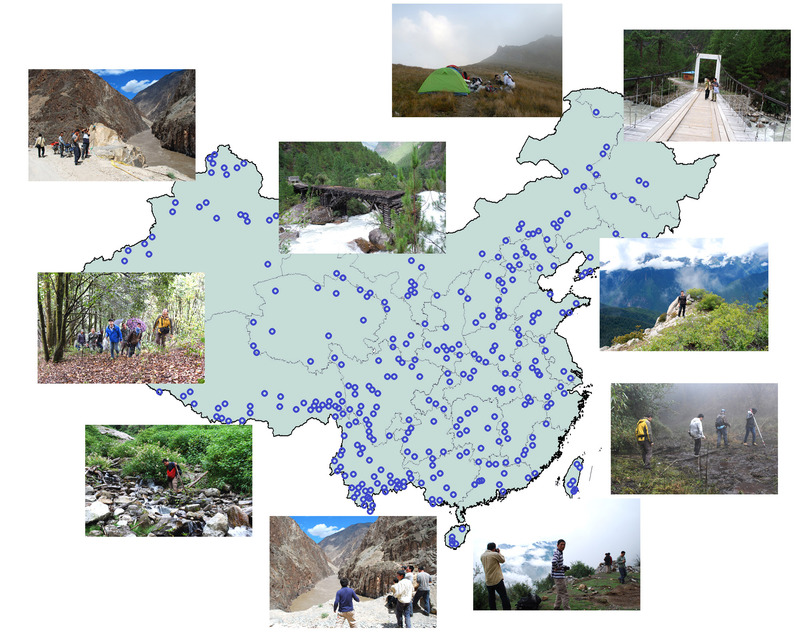 Since the 1990s, our team has been collecting specimens and DNA materials from all over China (Fig. 1), and we have obtained more than 30,000 vouchered samples in our DNA bank. We used our online molecular data analysis tool DarwinTree (http://www.darwintree.cn/) to clean data downloaded from GenBank and save sequences generated by our team. Sequences of four plastid genes (atpB, matK, ndhF, and rbcL) and one mitochondrial gene (matR) were used to reconstruct the phylogeny of Chinese vascular plants. We validated the available fossils and selected 138 calibrations for dating analyses. Our time tree, covering ca. 92% of angiosperm genera for the region, agrees with those obtained in recent studies of angiosperms on a global basis. We collaborated with Dr. Ling-Feng Mao from Nanjing Forestry University and assembled the spatial distribution data and information on growth form from nearly all published national and provincial floras, as well as some local floras, checklists, and herbarium records. The distribution data are at the county level (2,377 counties) with an average county size of approximately 4,000 km2. To minimize the sampling bias of unequal sampling areas, we divided the map of China into 100-km × 100-km grid cells; grid cells on the border that cover less than 50% of the area of a grid cell were excluded from the analyses. We also collaborated with the lab of Drs. Pamela and Douglas Soltis at the University of Florida, USA, and Dr. Jianhua Li from Hope College, USA, as well as Drs. Joseph Miller and Sarah Mathews from Australia National Herbarium, Dr. You-Hua Chen from Chengdu Institute of Biology, CAS, China, and Dr. Stephen Smith from the University of Michigan, USA, to investigate the spatio-temporal divergence patterns of the Chinese angiosperm flora by combining a robustly dated phylogeny and the spatial distribution data. Divergence time estimation shows that 66% of the angiosperm genera in China did not originate until the early Miocene (ca. 23 million years ago) and the herbaceous genera have diversified much more rapidly than the woody genera during the past 30 million years. The analyses of spatial divergence indicate that the flora of eastern China (particularly in central to southern China) bears a signature of older divergence, phylogenetic overdispersion (spatial co-occurrence of distant relatives), and higher phylogenetic diversity. 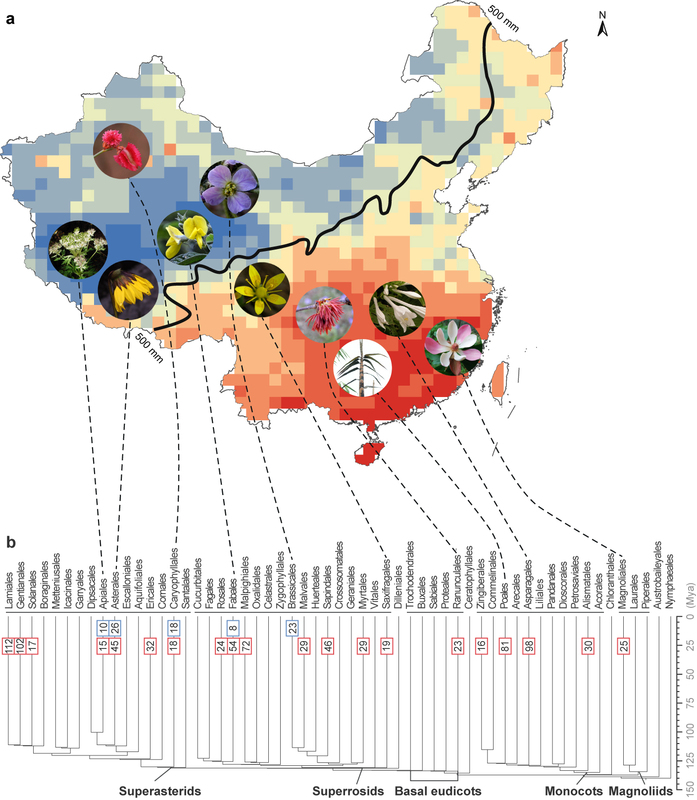 By contrast, the flora of western China shows more recent divergence, pronounced phylogenetic clustering (co-occurrence of close relatives), and lower phylogenetic diversity. These patterns are also observed in analyses of phylogenetic diversity based on multiple species-level trees using simulated branch lengths. Eastern China tends to be home to older lineages, such as Magnoliaceae, Euptelea, Circaeaster, Chloranthus, Fagaceae, and Impatiens (Fig. 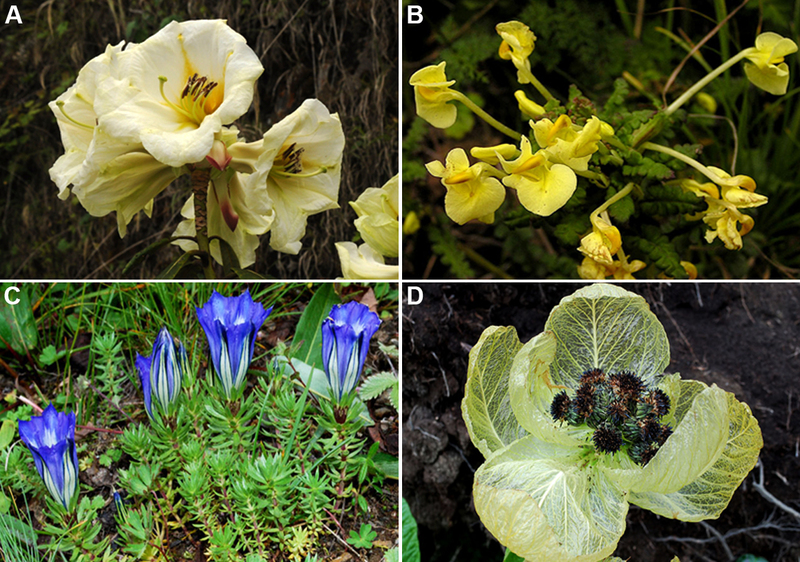 3), whereas western China contains more recently diverged flowering plants, such as Corydalis, Rhododendron, Primula, Gentiana, Saussurea, and Pedicularis (Fig. 4). We also detected that a much higher percentage of herbaceous than woody genera has originated since 30 Mya in western China. However, both herbaceous and woody genera diverged at similar rates throughout geological time in eastern China. 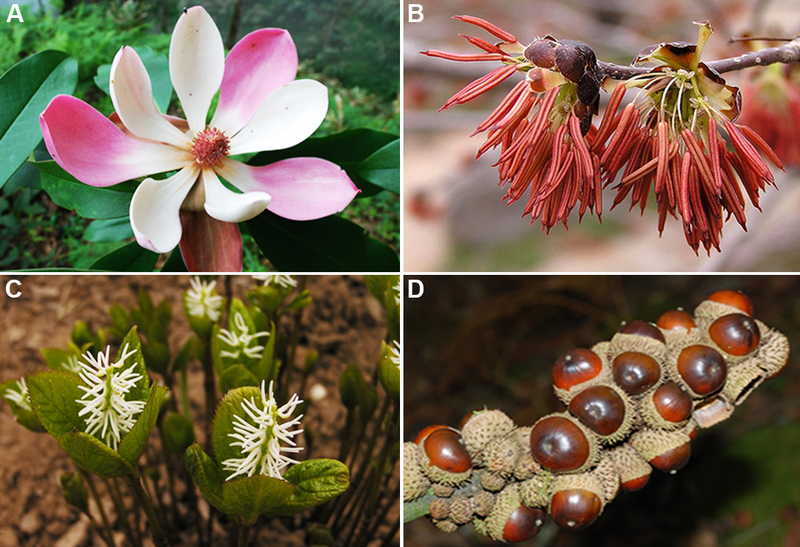 Our study suggests that eastern China represents a floristic museum, and western China an evolutionary cradle, for herbaceous genera; eastern China has served as both a museum and a cradle for woody genera. Our results reveal that phylogenetic diversity hotspots are mainly located in several provinces of eastern China (Fig. 5). 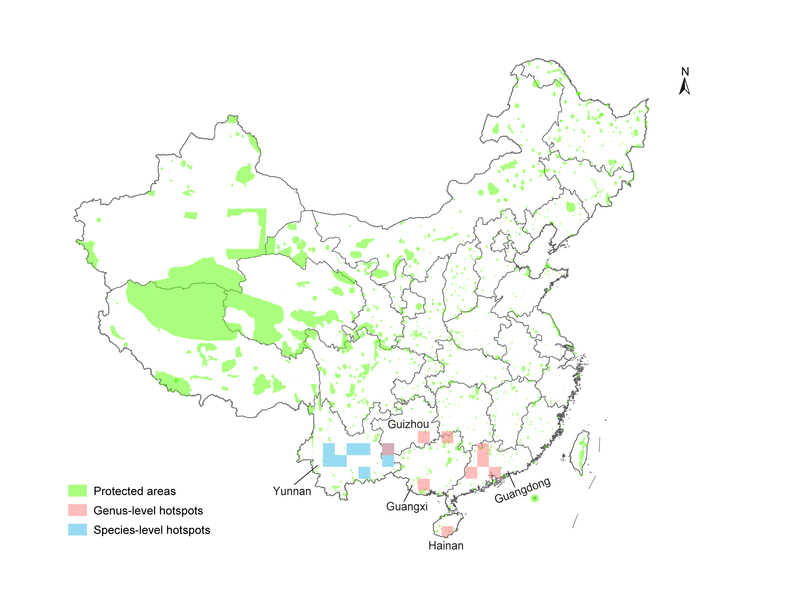 These areas are also hotspots for threatened plants in China, as inferred by previous studies. These results suggest the need to establish more connections between existing nature reserves and national parks that span provincial borders to conserve plant lineages of ancient and recent origins in eastern China, as well as the other organisms that depend on these floristic elements.